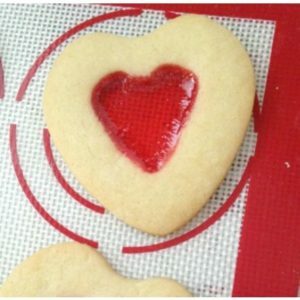 A couple of weeks ago I found these cute Valentine’s Day cookies on Pinterest. They look like they are really hard to make, but they really aren’t. You just need to have the right shaped cookie cutters. To make these cookies you can use any sugar cookie recipe. I will include my favorite recipe here. When you roll out the dough, cut out a heart with a regular sized cookie cutter. Next cut out the center of the heart with a small cookie cutter like the one in this mini cookie cutter set from Wilton. I purchased mine on sale at Joann’s but you can also get it inexpensively from Amazon. Sometimes Walmart has holiday mini cookie cutters too. After you cut out the centers of the hearts, use a spatula to carefully transfer them to a cookie sheet lined with parchment paper or a silicone baking mat . Place a red Jolly Rancher candy (I used red hot ones) in the center of each cookie. Bake the cookies for the time recommended by the recipe. When the cookies come out of the oven, let the cookies cool for a few minutes to give the candy a chance to re-harden. When the candy in the center is no longer soft, carefully move the cookies to waxed paper or wire racks to cool completely. Here is my favorite sugar cookie recipe. Mix together powdered sugar and butter. Add egg, vanilla extract, and almond extract. Mix well. In a separate bowl, stir together flour, baking soda, and cream of tartar. Add the flour mixture to the liquid mixture. Blend until smooth. Refrigerate dough at least an hour before using. Roll dough out and cut out cookies. Bake cookies at 375 degrees for 7 to 8 minutes or until barely brown around the edges. Makes about 3 dozen cookies.